You are here: Frontpage » Communications and Publications » IFCC Publications/Documents » IFCC eNews » eNews Volumes » Enews-2006 » January-february 2006 » How to register? The directive regarding "Harmonization for Specialists in Clinical Chemistry and Laboratory Medicine in Europe" was voted by the ministers' council the 6th of June and was published in the official journal the 30th of September. Acceptance of this directive is a wonderful support for the harmonization and the standardization of Clinical Biology in Europe. It gives the possibility to every European laboratory professional to register in a unique European database of Clinical Laboratory Medicine in Europe. This is an advice for European laboratory professional: register now! The European Register of Specialists in Clinical Chemistry and Laboratory Medicine opened in January 1999 and by November 2003 it comprised more than 1500 practitioners from 15 different countries, and the numbers are rising rapidly. Registrants include both scientific and medically qualified practitioners. 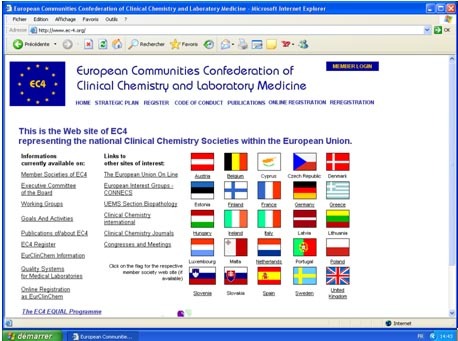 An on-line application form to join the European Register of Specialists in Clinical Chemistry and Laboratory Medicine may be obtained from the EC4 website (www.ec-4.org). Once completed this should be submitted electronically and a printout, together with a curriculum vitae and a single payment of 50 EUR, should be sent to the address given for the appropriate country. Successful applicants are admitted to the register for a five-year period, with no annual fee. A certificate is issued to all registrants. Subsequent re-registration will require the registrant to demonstrate that he/she is still in active practice and undertaking continuing professional development. Provides an important benchmark of quality across the profession within Europe. Develops the corporate identity of Clinical Chemistry and Laboratory Medicine in Europe. Assists with the promotion of Clinical Chemistry and Laboratory Medicine within Europe. Assists greater understanding of the practice of Clinical Chemistry and Laboratory Medicine within Europe. Provides a basis for pursuing agreed projects of common interest to the profession. Strengthens the influence of EC4 in dealings with other professional societies and the diagnostics industry. Increases the likelihood that the profession of Clinical Chemistry and Laboratory Medicine will be afforded Common Platform Status within the European Union. Provides a pool of experts who may be willing to work for the good of the profession.